Anaerobic Digestion is a miraculous process that occurs within all humans and animals. Anaerobic is a word used to describe an environment without oxygen, and digestion is a process in which organic material is broken down into simpler organic products. The giant tanks at WRR’s project site are sealed to prevent any seepage of oxygen and heated to approximately 100 degrees Fahrenheit. These conditions mimic the digestive tracts of animals where microorganisms breakdown organic material most efficiently. The tiny “bugs” eat the organic material and convert it into methane and carbon dioxide (along with water vapor and a few other trace gasses). In our system, the gasses are separated; the methane is used as an energy source, while the carbon is used to aid the growth of algae in greenhouses. 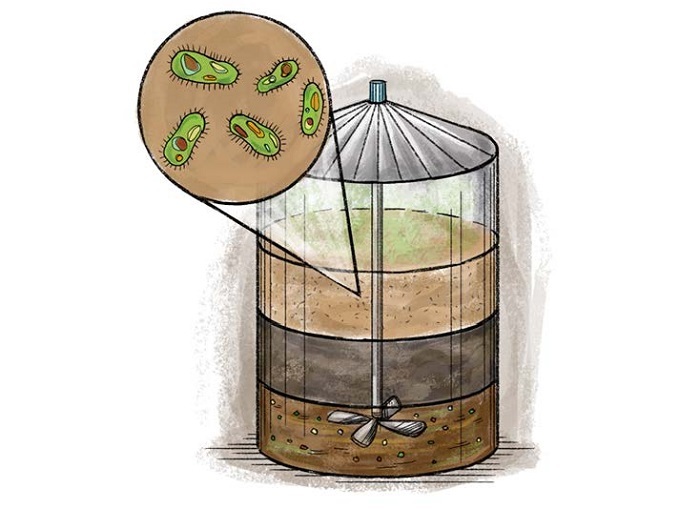 Additionally, the microorganisms leave behind a sludge that can be separated into liquids and solids. The liquid is recycled back into the Wastewater Treatment Plant while the solid is used as a bio-based fertilizer. This model imitates a phenomenon that takes place in nature known as “nutrient cycling.” In a world where 40% of food is wasted, Anaerobic Digestion is a modern, technological supplement to nutrient cycling in our own concrete jungle. To learn more, visit the EPA’s webpage dedicated to anaerobic digestion.